Kirsten grew up down the street from the Joy Cone factory in Hermitage, PA. Her grandfather founded the Joy Cone Company in 1918, now the largest cone company in the world. As a child, her family would visit the factory every week to enjoy an ice cream cone. The aroma of fresh cones baking wafted down the street and through her open window as a child. She loved ice cream, but also had a passion for health. Her mission was to find a guiltless ice cream. When she met Zak, he too, was health conscious but loved his sweets. Kirsten began to seek out healthy, delicious snacks that would satisfy his sweet tooth. In addition, Kirsten has with many food allergies and understands the need for allergy friendly foods & snacks that taste great! In June 2014, they moved to Lakewood Ranch, and fell in love with the area and community. They knew they had found the perfect location to open a store, where they could support other local business owners by offering their healthy products in their store. Together, they created D’Lites Shoppe. We carry three different types of ice cream. 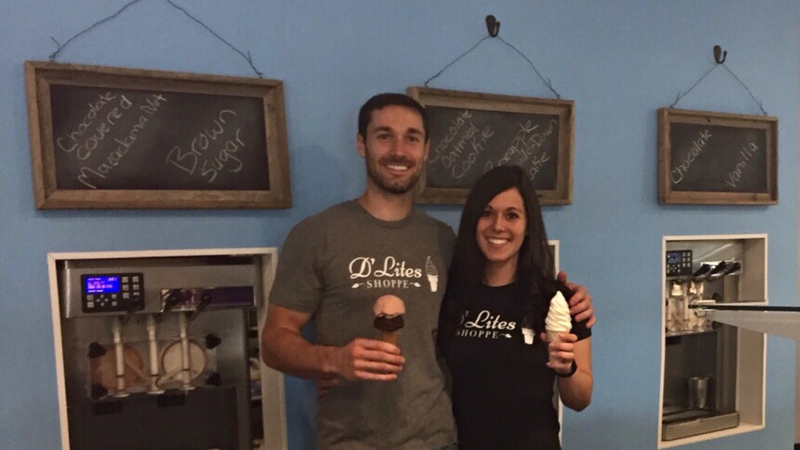 D’Lites is a creamy, soft serve ice cream that is low in sugar, fat, carbs and calories. LUV Nice Cream is a rich, flavorful coconut milk & cream based ice cream that is dairy-free, no sugar added, all natural & mainly organic, and LUV Artisan Ice Cream is a premium, all-natural, gluten-free ice cream made with certified organic ingredients when available and sweetened with stevia. We also carry a variety of healthy foods & snacks. Whether you try to maintain a healthy lifestyle, have a specific food allergy or follow a certain diet, we are the shoppe for you! We proudly serve joy cone.